Cambridge, Eng. : Cambridge University Press, 1997. 198 pp. $49.95. Novices interested in learning about Islam, beware; picking up the Koran and reading is not the way to go. Not only is the Koran an extremely condensed and symbolic text, but each line has been subject to intense scrutiny and interpretation over fourteen centuries. To understand the United States, after all, you would not start with a careful reading of the Constitution - and for roughly the same reasons. 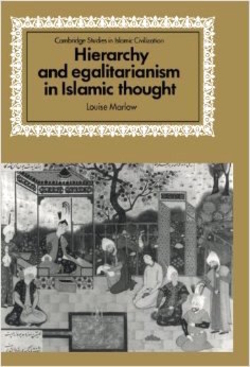 In a creative piece of research with profound implications, Marlow takes a single verse of the Koran and follows its checkered career through the first six centuries of Muslim history. The verse (49:13) has radically egalitarian implications: "O men! We have created you from male and female. The most noble among you in the sight of God is the most pious." She shows that the Arab conquests, abetted by Greek and Iranian influences, led to a highly stratified society very much at variance with this verse; then how the verse acquired an oppositional quality when political discontents adopted it as their slogan; and how over time the kingly courtiers and religious authorities worked jointly, and with success, to tame the egalitarian spirit of primitive Islam (by interpreting 49:13 to refer not to this life but the next world). Nonetheless, despite the growth of "hierarchical social ideals, the potentially subversive implications of 49:13 were not forgotten." In practical terms, the hierarchical social model may have been as well entrenched as in Europe, India, or China, but it could never win religious sanction and so remained more informal and less systematic than elsewhere. Jan. 20, 2004 update: For more on my argument against picking up the Koran and becoming an instant expert, see today's article, "Study the Koran?" Sep. 28, 2004 update: For my analysis of a different verse of the Koran and how its import changes over time, see today's article, "[The Issue of Compulsion in Religion:] Islam is What Its Followers Make of It."